Piranha Bytes’ new open-world RPG has a ton of Horizon: Zero Dawn and Skyrim vibes, but it spreads itself out far too thin. 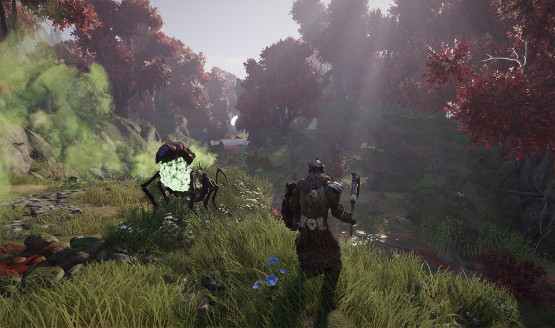 ELEX tries to be a bigger game than it ought to be, focusing on size and scope more fervently than its attempt at creating a compelling adventure. It’s a vast world full of shady characters and lost secrets, but it’s not one that actively kept me interested. The game’s Horizon vibes are front and center as it sets up a modern world gone tribal after a meteor collides with the planet of Magellan. Several factions inevitably rise from the chaos, initially fighting for any scraps that are left on the irradiated planet. But the discovery of a powerful energy source, from which the game takes its namesake, allows humans to turn into emotionless versions of themselves that are far more powerful—with a very high chance of also getting addicted to the substance and turning into blue-veined zombies. It’s a simple story set-up that allows your everyday RPG to take place in, but it gets a little tiring from the sheer amount of information overload. The world’s just not interesting enough to listen to countless NPCs drone about its history and the political climate of the warring factions. It also doesn’t help that the voice-acting is mostly poor, with the main protagonist taking most of the blame. Jax is a commander of the Alb militia, humans who have controlled their addiction to Elex and thereby gained a technological advantage over other factions. But the bigger problem with the main character is the inability to customize his initial appearance. In almost every other facet of the game, ELEX successfully mimics the design and structure of triple-A RPGs, but the developers have inexplicably not added a character customization option before the start of your adventure. Unsurprisingly, I didn’t ever feel any sense of ownership of my character, and thus treated him like a mercenary instead of projecting myself into the game or creating a fantastical warrior from my imagination. After reaching one of the several camps and attaining side-quests, recruiting companions, and trading with the shopkeepers, players can immediately explore any region of the game’s massive world. While the quest log fills up far quicker than I had anticipated, it allows you to go on adventures that are located at the other end of the region, the exotic and sometimes jaw-dropping land of Edan. While this approach is novel in theory, the game isn’t designed at all to make up for it. While other RPGs like the aforementioned Horizon restrict the player to one location before sending them on their merry way at a more appropriate level to take on powerful enemies, ELEX is impossibly difficult in its opening area straight from the get-go. Even with a dozen low-level quests, I found it nearly impossible to beat a quest without somehow cheating the game or relying on third-parties to help me in battle. Due to the fact that Jax is stripped of his armor in the opening cut-scene and without vital equipment to actually explore the world alone, I had to scour through paragraphs of sidequest descriptions to find those that did not involve combat. What the game doesn’t tell you is that certain sidequests are somehow more important than the early game main missions. It took me a few hours to realize what I was supposed to do to be able to run out on my own. It’s not difficult for difficulty’s sake, but rather the poor design decisions to not get the player going as quickly as possible. The various factions on the planet of Magellan, of which the player is constantly hounded to join, equip themselves with different weaponry based on their philosophical standing pertaining to the use, misuse, or rejection of the Elex substance. From the magic of the Berserkers to the high-tech, Elex-addicted Albs, there is certainly a clear distinction in enemy types. Most of the combat will be hand-to-hand with heavy and light attacks complimented by the press of the triangle button for a special attack that usually shows off a hilarious animation. There are clear delineations on the map of which faction owns a certain region, and I loved the open nature of their various camps and settlements. You can just waltz in and begin to be assaulted by an armada if you aren’t already on friendly terms. The creatures that inhabit the land are useful allies if you can get them to focus on your enemies while flinging arrows their way from a safe distance. While most enemies are quick and annoying, some of the larger variants like robots and trolls are a blast to do battle against. And for jet-pack fans like me, ELEX has just about the most over-powered one I’ve ever seen that resulted in some hilarious platforming. There’s a lot of fun to be had in ELEX at higher levels, but the game opens far too slowly and spreads itself out too thin to make any sort of impact. It’s a game that begs to be smaller in scope, and richer in depth. And while its animations and visuals are mostly uninspiring, there are some real moments of beauty that are found in its caves and crevasses if you choose to explore the land of Edan. ELEX PS4 review code provided by publisher. For more information on scoring please see our Review Policy here.